Could your fever, body aches, cough, and sore throat be the flu? Soon, finding out may not involve a trip to the doctor. Right now, diagnosing the flu is something done at your doctor's office or hospital and involves a gag-inducing brushing inside your nose to collect cells containing the flu virus. Then, either a rapid (but not very accurate) test can be run in about 30 minutes on the sample collected or the sample can be sent to a specialized lab where they can grow and identify any flu virus present in the sample over a period of days. A new rapid test has been developed by Bradley Smith, a professor of chemistry and biochemistry, and a team from the University of Notre Dame. The simple test could be easily adapted for at-home use or at hospital bedsides or doctor's offices. Research describing the development of the new flu test was published in April in the Journal of the American Chemical Society. Two proteins present on the surface of influenza type A — hemagglutinin and neuraminidase — provide the letters by which we name flu strains. H is for the type of hemagglutinin in the virus, and N is the type of neuraminidase. For example, the swine flu is caused by H1N1. The test developed by Smith and his colleagues detects neuraminidase on the surface of the flu virus. In the test, neuraminidase — from the patient sample — interacts with a red dye, causing it to emit a red fluorescent light that is detected with a special lamp. Since fluorescent light emitted from this type of reaction fades pretty quickly, the scientists added tiny beads in their test system to capture the light so that the result lasts longer. If the new test emits red fluorescent light, the sample contains flu virus. Blue fluorescent light is a negative result. 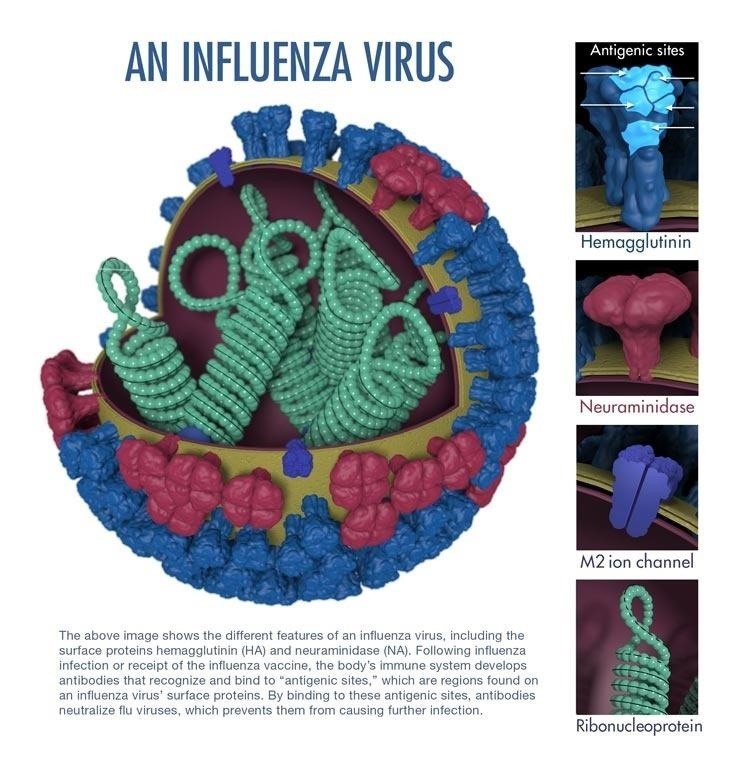 The researchers tested their new flu detection system with antiviral drugs — because different types of neuraminidase are inhibited by different antivirals. They mixed the dye, beads, and neuraminidase from the flu virus with two different antiviral drugs — zanamivir, also known as Relenza, and oseltamivir, known as Tamiflu — used to treat the flu. These drugs are neuraminidase inhibitors, therefore they block the activity of the enzyme. Red fluorescence indicated the enzyme was still active, meaning the antiviral drug was not inhibiting the neuraminidase. Blue light indicated the enzyme had been blocked, and suggested an effective treatment option. Future development of the test for at-home use might use saliva or nose swabs as the test samples, Smith told Invisiverse. "In the case of a pandemic that contaminates entire buildings etc, wipes could be made of the different locations to confirm successful decontamination," he said. One could envision a simple device that looks like a pregnancy test with a blue laser pointer. But, I expect the final device to be a hand-held disposable box that will have its own built-in illumination and reading capability (both are very cheap). The user would simply get a yes or no response. If you do visit a doctor, the scientists hope this new test can be used there to rapidly diagnose flu infection and also determine which antiviral inhibitor drugs might be the most effective for your infection. With further optimization, this new type of fluorescent neuraminidase assay may be useful in a point of care clinic to immediately determine which of the two currently approved antiviral inhibitor drugs, Oseltamivir (Tamiflu) or Zanamivir (Relenza), is likely to be the most effective treatment for an individual patient. Imagine not having to leave the comfort of your bed or home when stricken with what you think might be the flu to diagnose your illness, not to mention going to the doctor's office or urgent care facility where you can infect others. A case of the flu can't be treated with antibiotics and the usual treatment is to stay warm, rest, get plenty of fluids, and take fever reducers. Early in a flu infection, however, antiviral drugs may help relieve severe symptoms and will have to be prescribed by a doctor. That will involve a trip to the doctor, but if the new test is used, at least you will leave knowing that the drug you're given will work for your type of flu.